I grew up watching sports. Whenever my brothers and Dad get together we either watch football, basketball, or baseball on TV or go to stadiums. We cheer mainly for our bay area teams (49ers, Golden State Warriors, San Francisco Giants) and of course our BYU Cougars. Even if one of these teams doesn't happen to be playing, however, we will watch whatever game happens to be on. Camilia is still getting used to this lifestyle. I believe she is starting to embrace it. To give you an idea of what sports mean to me, March is my favorite month. It isn't my favorite because it's my birth month or for St. Patrick's Day, but because the greatest event in all of sports (IMHO) occurs in March. For a few short weeks the nation is captivated by the most exciting display of athleticism, passion, drama and "madness" that even Hollywood couldn't make up. To me, sports represent so much more than simply being excited when your favorite team scores a touchdown or hits a home run. Sports represent history and culture. They represent generations of tradition that have truly shaped the great nation that we live in today. They bring families together, and they help nations and communities heal when tragedies occur (9/11 is the greatest example of this in my opinion). It's for these reasons, and a few more, that I was in absolute sports heaven on our recent trip to Chicago. 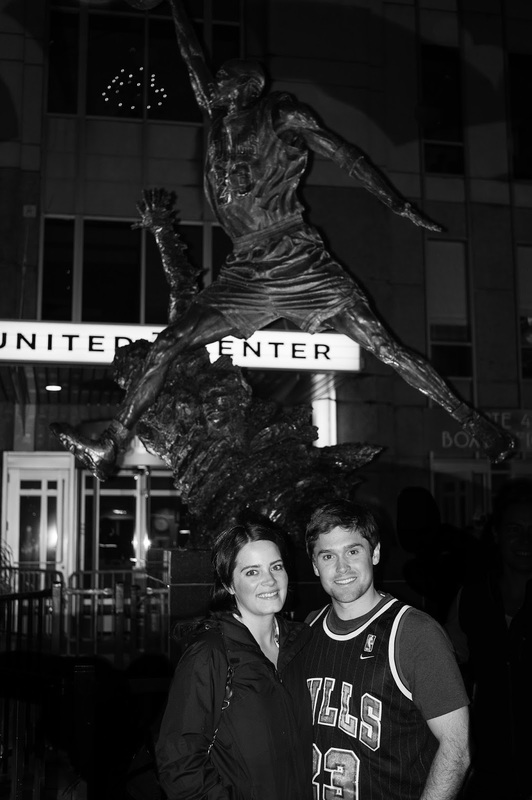 We had the opportunity to visit four of the most iconic sports arenas in history, and watch games at two of them. 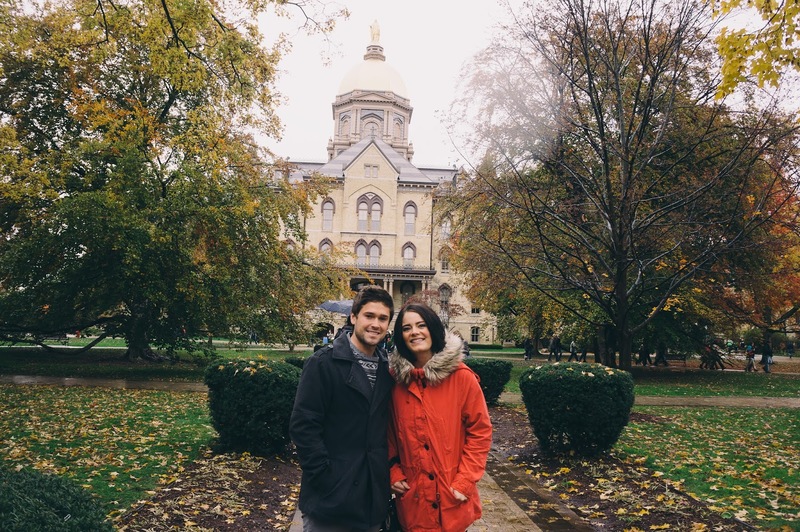 We visited Wrigley Field and Soldier Field (not pictured) and saw the Bulls and Irish play at the United Center, and Notre Dame Stadium. 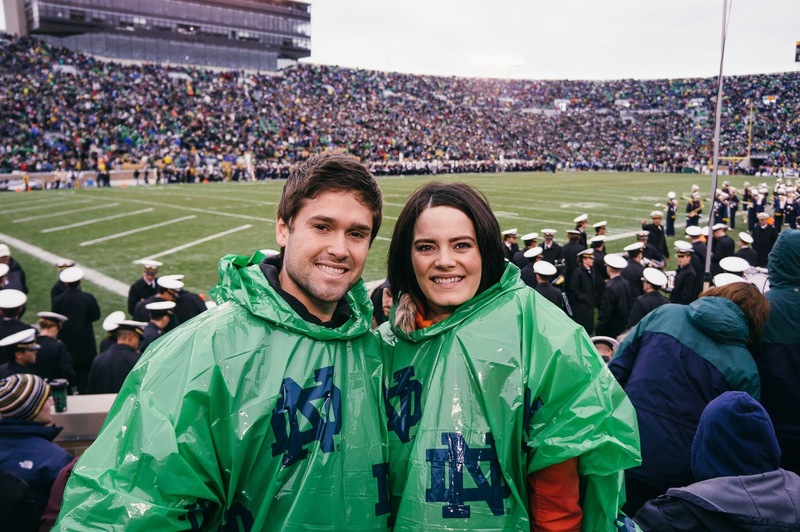 If you don't recognize the following phrases, you may not appreciate what we experienced: Monsters of the Midway, Super Bowl Shuffle, Wrigley Field's Ivy, His Airness, The Flu Game, the Fighting Irish, and Rudy. If you are an individual who doesn't recognize these phrases, I hope I can still help you appreciate my love of sports in the following paragraphs. 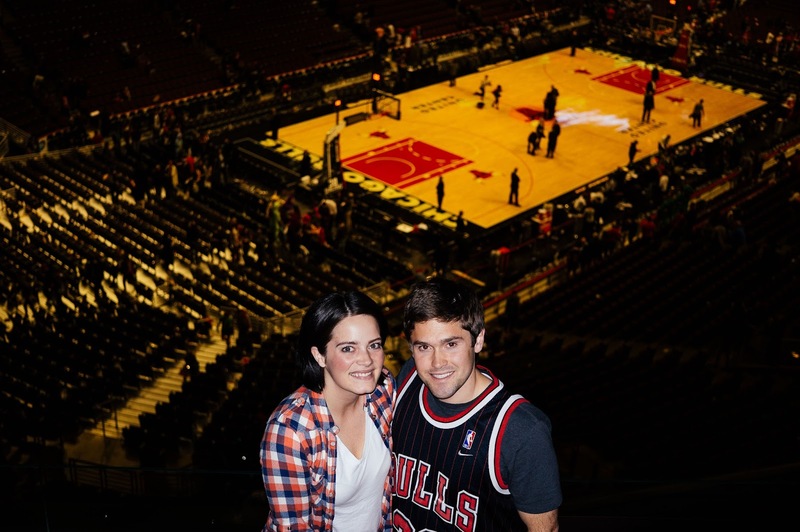 The first game we were able to witness was the regular season home-opener of the Chicago Bulls. Not only was it the first game of their season, but it was also the long-anticipated return of their best player, Derrick Rose after missing over a year of action due to a knee injury. For me, it was literally a dream come true to be in that environment. The passion that the Chicago fans displayed was more than I have ever witnessed in person. It was louder than I can describe, as was the excitement that filled the air as their best player returned to the court. This leads to one reason I love being at sporting events: you actually have an impact on the outcome of the game as a fan. If you haven't been surrounded by sports as I have, you may be wondering how that is possible. You may say, "How could I change the outcome of a game that professional athletes are playing in? There is no way that my small applause and cheers could change the results of any game." People that think this way are probably the same people that don't vote in elections because "their vote doesn't count." 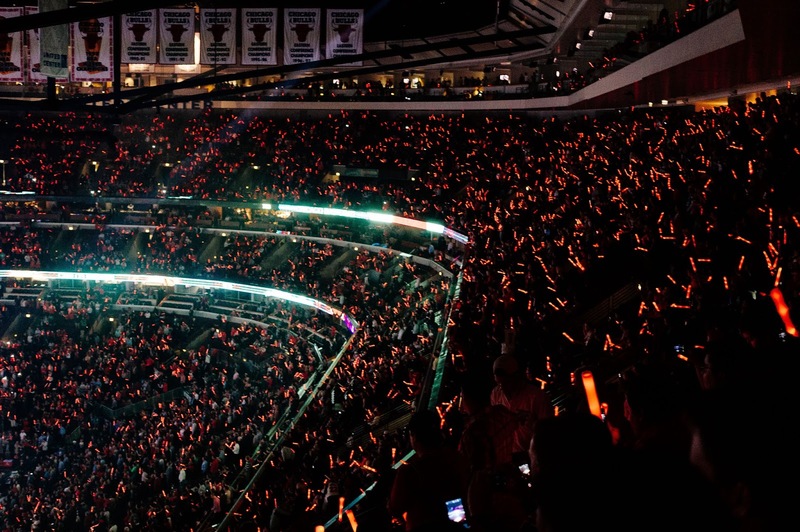 I personally witnessed at the United Center (and have witnessed in countless games of all sports) the effect that passionate fans can have on the outcome of a game and the play of both their home players (for the better) and visiting players (for the worst). The passion that the Chicago fans displayed, as well as simply being in the house that Michael built, could have been enough for me. But the sports gods were smiling upon me that Halloween night. One of the many reasons I watch sports is for the anticipation and drama. Literally anything can unfold as you are watching a sporting event, which is exactly what happened in that game we witnessed live. Although the Bulls were leading the majority of the game, they found themselves down 10 points with just a few minutes to go. A bad fan at this point would have walked out of the arena to beat the traffic (I absolutely hate this concept. Stay until the end of the game unless it's an absolute blowout). But a good fan stays, even if there is the slimmest chance of his or her team making a comeback. It was at this point that the crowd rallied behind their team, got loud and wild, and gave their team (which was our team for that night as well) the energy and hope they needed. After a 12 point run, the Bulls found themselves down 1 point with 10 seconds left. It was then that the drama unfolded. 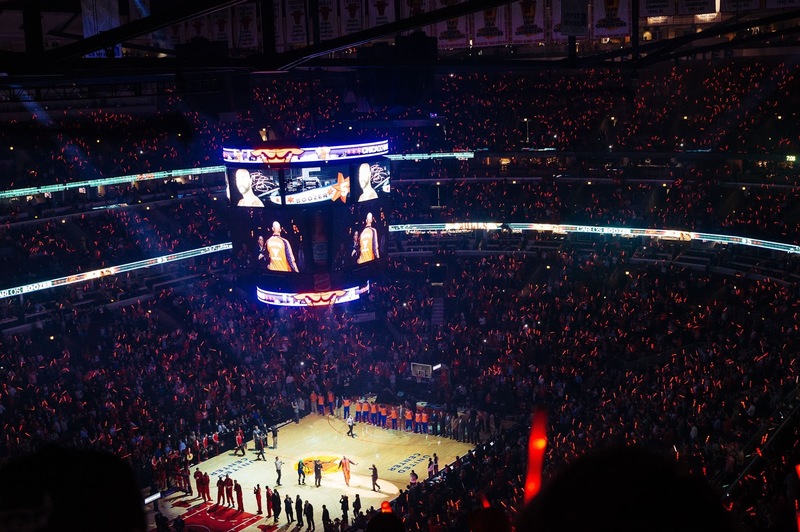 When the ball was inbounded to Derrick Rose, every single person in the United Center was on their feet in anticipation of what would happen next. This, my friends, is why we watch sports. We watch sports for moments like this, not knowing what will happen, but having an absolute hope and desire that your team will be able to make the play they need to when it matters most. As Rose drove to the baseline, surrounded by Knicks defenders, he threw up a floater over their outstretched arms that seemed to touch the rafters of the arena and float for an eternity. During that eternity, you could have heard a pin drop in the arena. The collective breaths of over 20,000 Bulls fans were being held. As the ball swished through the net it was as if every single person had willed the ball through the hoop. When the shot fell and the buzzer sounded, Chicago must have experienced some seismic activity because the place erupted. With their star back on the court for the first time in 18 months, he had willed them back to victory and won their home opener. 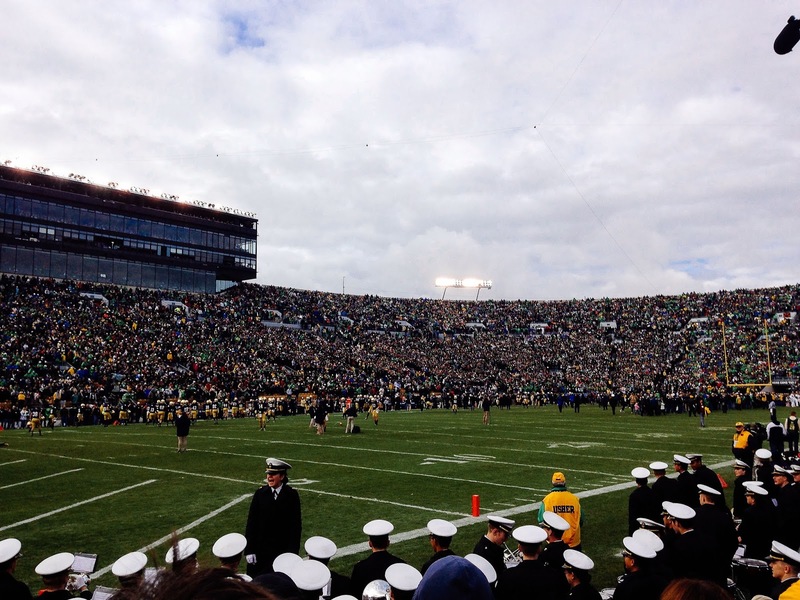 The second game we were able to witness was Navy vs. Notre Dame at Notre Dame stadium. It was a cold, rainy game, but I didn't care. I was in college football mecca. I absolutely love going to college football games at BYU, but this was on a whole new level. We arrived early to be able to tour the campus (which was absolutely beautiful with the old buildings and changing colors of the trees) a little bit before the game started. What I didn't expect was for the entire campus to be filled with thousands of fans. They had tents set up with barbecues all over the place, mingling with their friends in anticipation of the big game against one of their biggest rivals. The atmosphere and excitement before the game was contagious, with the climax being the cheerleaders and band marching through the whole campus playing the school's fight song. I got so pumped when I saw and heard this. The famous Notre Dame fight song that I've heard a hundred times watching games on TV and watching the movie "Rudy" (which if you haven't seen is an absolute must-see) was actually being played by the band as they marched through thousands of Notre Dame faithful through the most beautiful campus in the world. This is what I was talking about when I mentioned tradition and culture. These people and their parents, grandparents and great grandparents have been doing the exact same thing, singing the exact same song, every Saturday during football season (when their team is in town) since the first time Notre Dame played football in 1887. For a lack of better words, it was so cool. For some reason I was able to find cheap tickets on the 5th row of the stadium, sitting (well, for the most part standing) on the old wooden benches with no back that adorn the entire stadium. It was incredible being so close to the action. (Side note: it is one of my life long goals to sit front row at any NBA game before I die. I will accomplish this goal.) We sat right behind Navy's band, which was a lot of fun to see how into the game they were. They were focused and intense on the game the whole time, and were doing everything in their power to will their team to victory. They didn't want to lose to their rivals. The fans of Notre Dame would not go down easily, however. The passion and emotion we saw on Notre Dame's campus before the game transferred into the stadium as well. Every fan in the stadium knew every word to the fight song, and would sing it every time it was played. The fans we were sitting next to and talking with knew the names of every player and would cheer for them by name. They, too, wanted this victory with all of their hearts, and cheered as loudly as they could to will their team to a victory. This rivalry, along with the rich tradition, culture, and campus that we were able to experience would have been enough for me. But the sports gods were smiling upon me once again. The game was a hard fought, physical battle fought mostly with their running attacks (typical for wet conditions). The teams traded scores and leads for the majority of the game. Notre Dame found themselves up 38 to 34 with 68 seconds left in the fourth quarter, but Navy had the ball and was driving down the field for the game-winning score. It all came down to one final play. It was 4th down and 4 yards to go. All Notre Dame needed to do was make one more stop, but the way Navy was running the ball it was no easy task. As Navy lined up to try and convert the 4th down and keep their hopes of winning the game alive, the Irish faithful couldn't have been any louder. Once again, Camilia and I were on our feet in anticipation for the drama to unfold, waiting to see what would happen and screaming as loud as we could to will our home team (if only for that one game) to victory. What happened next was unexpected. They ran a reverse to try and catch the Notre Dame defense off guard. This time, instead of the home team's star player making the play that his team needed (as D-Rose did for the bulls) it was a freshman linebacker who saw the play unfold, sprinted to the ball, and tackled the Navy ball carrier to the ground, ensuring the Navy defeat. I love sports because anything can happen, and any player can make the difference. The crowd erupted as victory was now in their hands, with only a few kneels of the football separating them from the win. Okay, I'll get off my soapbox now. I love sports, and now you know a few of the reasons why. 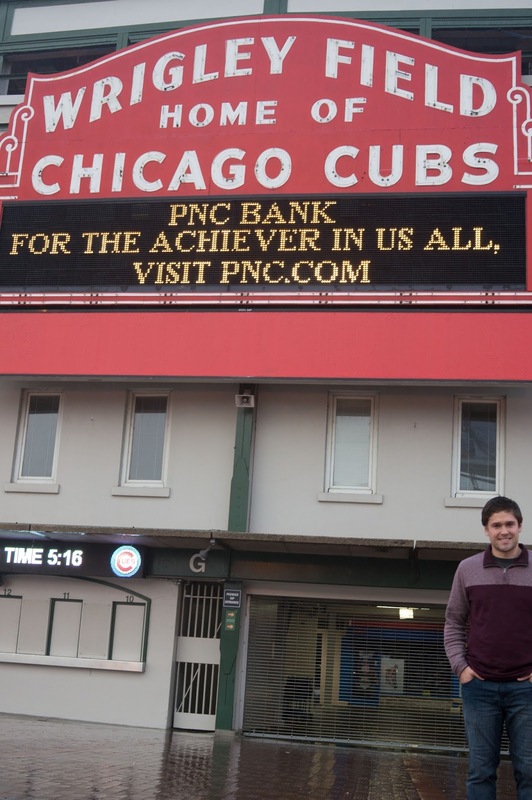 Our trip to Chicago was a dream come true for me. I loved being able to see the things we saw, and I'm so glad I was able to do it with Lady Lund.